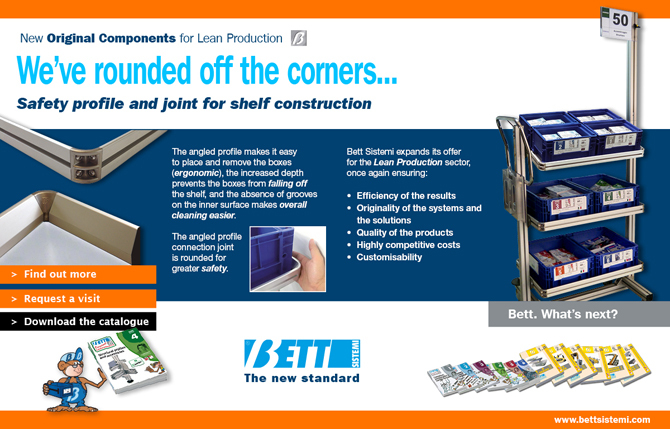 Bett Sistemi expands its offer for the Lean Production sector with the new accessories for trolleys. The angled profile makes it easy to place and remove the boxes (ergonomic), the increased depth prevents the boxes from falling off the shelf, and the absence of grooves on the inner surface makes overall cleaning easier. The angled profile connection joint is rounded for greater safety.